Despite his clear sense of whimsy, Jean-Pierre Jeunet has never exactly directed a children’s film before—and despite its youthful protagonist and point of view, The Young And Prodigious T.S. Spivet still might not qualify. Based on the Reif Larsen novel, Jeunet’s second English-language film (which was released in Europe two years ago, and has been sitting on the high-capacity U.S. shelves of Harvey Weinstein since then) follows 10-year-old science prodigy T.S. 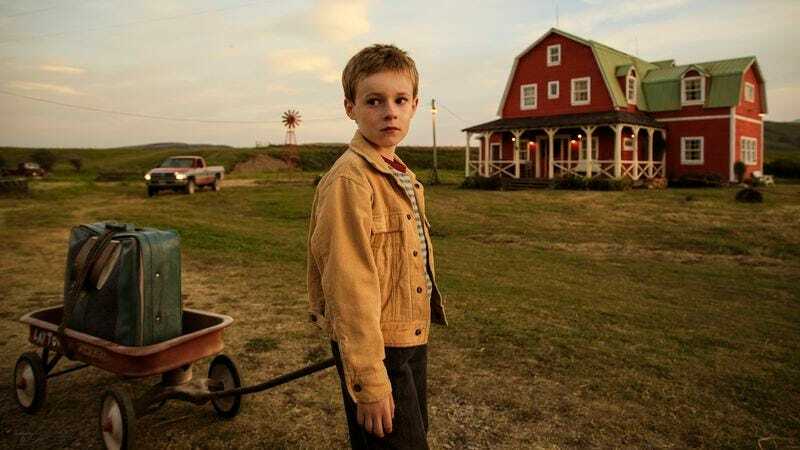 Spivet (Kyle Catlett), growing up on a ranch in Montana, closer in temperament to his bug-studying mother (Helena Bonham Carter) than his rancher father (Callum Keith Rennie), who sees himself in T.S.’s twin brother Layton (Jakob Davies), a more rough-and-tumble type. Background on the Spivet family, which also includes perpetually exasperated older sister Gracie (Degrassi’s Niamh Wilson), is filled in with a variety of flashbacks, digressions, and descriptions (including narration from young Spivet himself), all of which probably flowed fine on the page but proceeds haltingly on-screen. The lack of narrative fluidity is surprising, because some of Jeunet’s other films, like Amélie or Micmacs, are busy, bordering on frenetic. Here, even while dealing with the active brain of a child genius that annotates some of the on-screen images with various calculations and classifications, his work feels lower key, sometimes even rusty. It doesn’t help that the dialogue, especially in the film’s first half-hour, has too many pauses built in, leaving some of the performances at a stilted remove. This may be intentional, emphasizing the disconnection the Spivet family has felt following a recent tragedy (not revealed in fullest detail until the last section of the movie, in another moment that feels more literary than cinematic). But the movie picks up when T.S., having followed a “quest for perpetual motion,” wins a prestigious scientific award from the Smithsonian for his work, with the museum’s officials unaware that their recipient is prepubescent. He sets out to attend the award ceremony in Washington, D.C., via a hobo-style freight train adventure, which is one reason Spivet may qualify as movie for kids; at times, the film also suggests a less whiz-bang flip side of Brad Bird’s Tomorrowland, and there are even traces of Tom Sawyer when T.S. insists on picking a more “interesting” route through his house to simply answer the phone. Even at its zippiest, though, The Young And Prodigious T.S. Spivet is infused with a pervasive sense of melancholy and loss, with a family that seems as damaged as they are lovably quirky. In the United States, this kind of story is more often told to kids through more ambitious animated films; American live-action kid movies tend to favor chipper suburban families banding together to weather slapstick zaniness. During its cross-country train trip, the film captures beautiful moments like a passing bit of eye contact between T.S. and a girl hanging by herself on a jungle gym, and a nighttime stopover at a train yard. (Shot in golden browns and yellows, and featuring Jeunet regular Dominique Pinon, this scene bears the director’s stamp more clearly than any other.) And when T.S. gets hurt, he stays hurt; his scrapes and bruises have non-fantastical authenticity. The train section takes up enough of the film to insulate it against the disappointment of its final stretch, which pairs the likable but not transcendent Catlett with a mugging Judy Davis as a Smithsonian rep, and confirms that Jeunet is no one’s idea of a canny media satirist with a hammy talk-show-set climax. The movie is more observant when it stays personal, as when T.S. offers brisk scientific analysis of fake smiles. But while it doesn’t operate at its full potential, Spivet nonetheless offers a bracing risk: a kid adventure with danger alongside its whimsy and sadness alongside its reassurances.